Many modern cars now include blind spot monitors. These monitors are sensors, often located in the side-view mirrors, that alert drivers when there is a car or other hazard in the blind spot during lane changes. Some vehicles will warn only when the turn signal is activated while others will warn whenever the blind spot monitor is triggered. At Caspian Auto Motors, we want to keep you as safe as possible when you're driving. 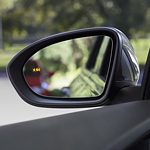 Blind spot monitors can decrease lane-change accidents by 14%. Make sure that you are driving a vehicle with the latest safety features to keep you injury-free.